Invented in 1999, long before its time and subsequently chosen as an ISO/IEC 11801 Ed 2.0 interface for category 7/class F, the Siemon TERA is by far the highest performing twisted-pair copper connector in the world. When installed as part of a TERA solution, each pair delivers up to 1.2 GHz of bandwidth ­ exceeding the bandwidth of category 7A/class FA specifications. This extra bandwidth is critical in demanding applications such as broadband video, with an upper frequency requirement of 862 MHz. Broadband video, high speed data and voice applications can be supported simultaneously using a single 4- pair fully shielded (S/FTP) cable. 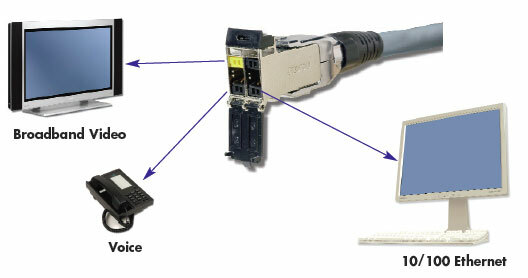 TERA outlets can be used in both the work area and in the telecommunications room. Up to four simultaneous applications may be served with a single 4-pair, S/FTP cable and TERA outlet, saving significant materials, labor and space. (Voice, broadband video and high speed data shown).